Presidential candidate Ollanta Humala (Gana Perú) leads electoral preferences with 42 percent of vote intention, followed by Keiko Fujimori (Fuerza 2011) who has 36 percent, according to the latest urban-rural poll made by Ipsos-Apoyo nationwide. Ten percent of the polled people were undecided about who would they vote for, and 12 percent voted blank or invalidated their vote. Ipsos-Apoyo's poll is the first made public – requested by El Comercio – after the presidential elections that took place on April 10. 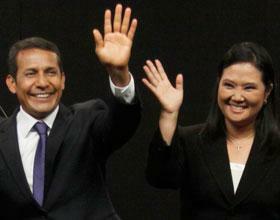 The runoff between Humala and Fujimori are scheduled for June 5. Humala's stronghold of support remains in Peru's south (53 percent), followed by the central regions of the country (48 percent). Keiko has its biggest support from the Amazonian regions (38 percent), followed by Peru's north (36 percent). In the case of Lima voters, Keiko's candidacy has a bigger support over Humala's (43-35 percent), but the ex-military officer has an advantage over former president Fujimori's daughter in the rest of the country: 44 percent (urban) and 47 percent (rural), versus 33 percent (urban) and 32 percent (rural). When people are asked who will Pedro Pablo Kuczynski's voters in the first round vote for in the runoff, 41 percent think they will vote for Keiko, and 20 percent for Humala. When the same question is asked about Toledo's supporters, 37 percent think they will vote for Humala, and 32 percent for Keiko. Of Castañeda's voters in the first round, 34 percent will vote for Keiko, and 24 percent for Humala. From the 1,802 people polled nationwide, 37 percent are totally sure they will vote for Humala, while 30 percent are totally sure of doing so for Keiko. There is a substantial increase of support in both candidates compared to the official results of the elections where Humala has 31.7 percent and Keiko 23.6 percent, according to the National Elections Office (Onpe). "He represents a change" is the main reason why people will vote for Humala (52 percent), followed by "he will put order" (38 percent); "he is new in the government" (38 percent); "he will help the poor" (26 percent); and because "he will change the economic model" (24 percent). "Her father's government was a good one" is the main reason why people will vote for Keiko Fujimori (43 percent), followed by "she is a woman" (34 percent), "she will help the poor" (30 percent); "she will put order" (21 percent); and because "she is honest" (18 percent). Concerning people's doubts about each candidate, the majority think that Humala will not shut down Congress (63 percent), versus a quarter of the people polled that think he will close it (25 percent). Likewise, 50 percent think the ex-officer will not stay more than one presidential period in power, while 39 percent think he will. Fourty four percent of people polled do not think Humala's campaign is being financed by Brazil's ex president Luiz Inácio Lula de Silva's political party, while 36 percent think it is. Forty eight percent of people do think that Venezuela's Hugo Chávez is financing Humala, versus 39 percent who think he is not. Likewise, 47 percent of people think Humala will join Chávez and Evo Morales' political and ideological block, while 42 percent think he will not. When people are asked if Keiko will free her father from jail, former president Alberto Fujimori, 68 percent think she will and 26 percent think she will not. A vast majority think she will not close down Congress as her father did (76 percent), but a small minority (16 percent) think she will. Likewise, 61 percent think Keiko will not liberate people in jail for corruption charges, versus 29 percent who think she will. Finally, 61 percent do not think Keiko will liberated former intelligence chief, Vladimiro Montesinos, while 32 percent think she will. Another 60 percent sustain she will not free military personnel condemned for human rights violations, but 30 percent of people polled think she will. Also, 59 percent think that Keiko will not let Montesinos influence an eventual administration of hers, while 30 percent think the opposite.